For some Asian Americans, it's a familiar yet troubling story. Recent articles in The New York Times ("The Asian Advantage") and The Economist ("The Model Minority is Losing Patience") have focused on a racial group considered to be one of the most successful in America and the numbers are compelling. And they earn a lot more: $74,105 in median income versus $53,657, according to Census Bureau's 2014 American Community Survey. But behind the numbers is another story. "When you dig a little bit it shows that we are not all doing as well as society, the government and other institutions would lead you to believe," said Christopher Kang, the national director of the National Council of Asian Pacific Americans. "We do have a very diverse population and very diverse needs." On Monday, Kang penned a response to the New York Times piece by Nicholas Kristof that addressed the success of Asian Americans. Asking "Why are Asian-Americans so successful in America" is "uninformed" and "perpetuates stereotypes," Kang wrote. Specifically, Kang referenced the lower levels of educational attainment among groups like the Cambodian, Vietnamese and Hmong communities. In fact, Census data shows that just 15.3% of Hmong Americans, 18% of Cambodian Americans and 28.4% of Vietnamese Americans have a bachelor's degree or higher. Meanwhile, 72.5% of Indian Americans hold a bachelor's degree or higher. And more than half of Chinese Americans and Korean Americans hold advanced degrees. Kang also cited poverty among Asian Americans as another often ignored issue. The overall poverty rate for Asian Americans is 12.5%, well below the national rate of 15.5%. 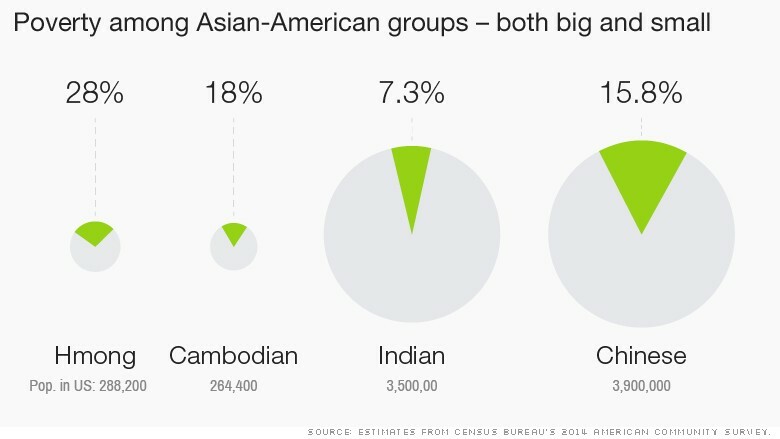 But among different Asian American groups, the rates vary significantly. 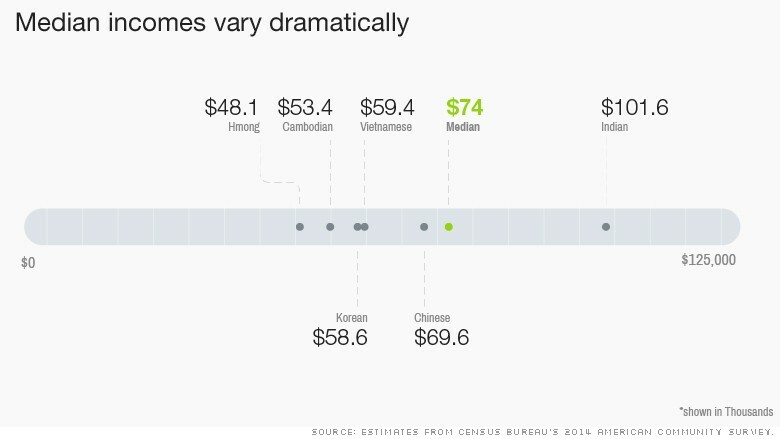 For Indian Americans, for example, the poverty rate is 7.3%; for Chinese Americans it's 15.8%. 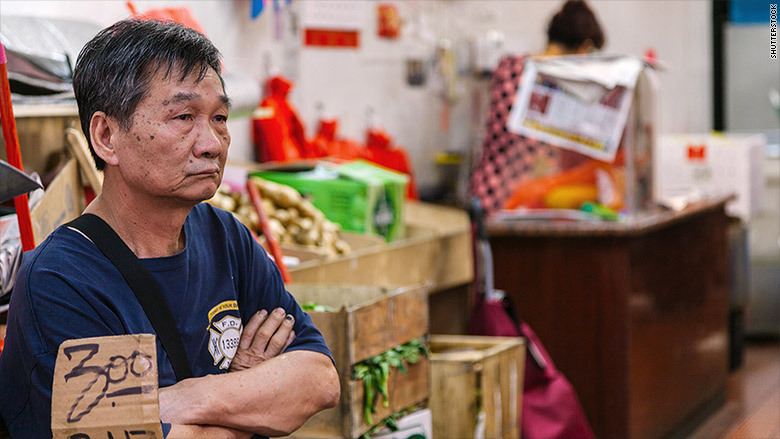 "There are still garment workers, and the people who give you your foot massage in Chinatown, there are still low wage workers," said Sylvia Chong, the director of the Asian Pacific American Studies Minor at the University of Virginia. "People don't see that. That's an economic underclass." High household incomes among Asian Americans can also be explained by the fact that some live in multi-generational homes with more than one person earning an income, said Jennifer Lee, a sociology professor at the University of California at Irvine and the co-author of the book "The Asian-American Achievement Paradox". "You have parents, grandparents, an aunt, some children," she said. Kang also counters the idea that Asian Americans are "disproportionately stars" in America as Kristof says in his piece. Asian American and Pacific Islanders represent just 2.6% of corporate board seats and 2% of executive officers of Fortune 500 companies, according to data from Leadership Education for Asian Pacifics. Kang was not alone in his critique of the Times piece. Some took to Twitter to air their discontent. Arissa Oh, the author of "To Save the Children of Korea" called Kristof's column "Textbook Orientalism"
#alllooksame, all the same, all Confucian and hardworking and whatever... We are an undifferentiated mass. Textbook Orientalism. Ellen Wu, the author of "The Color of Success: Asian Americans and the Origins of the Model Minority" questioned why people were so obsessed with explaining the success of Asian Americans. At end of day I'm left wondering: Why are all these commentators, etc. obsessed with the question "Why are Asian Americans so successful?" In an email sent from Nepal, Kristof said that he was glad to see the conversation his column provoked and thought readers raised some valid points. He added, however, that he "wasn't much impressed by the idea that Asian-Americans are a diverse group -- of course they are, but so are whites and African-Americans and Latinos, and yet it's still useful to look for lessons in data by ethnicity." To his credit, Kristof re-tweeted Kang's piece calling it an "interesting critical take." According to Kristof, the larger point of his piece was to question whether racial discrimination still existed for Asian Americans despite the successes that some Asian Americans experience. "At the end of the day, many whites argue that the success of Asian-Americans proves that the age of discrimination is over," Kristof told CNNMoney, "and you simply have to respond to that argument head-on rather than elide it." In his column, Kristof cites "East Asia's long Confucian emphasis on education," strong two-parent families and an enduring work ethic as the primary reasons Asian Americans do better than other groups. But it may be better explained by history -- at least in part. After the Immigration and Nationality Act of 1965, the United States experienced a wave of mostly highly educated East Asians, including Chinese, Korean and Japanese immigrants. Children of educated and professional parents tend to model their parents, said Lee, of U.C. Irvine. But that group was followed by a second wave of Asian immigration a decade later that was comprised mostly of refugees from countries including Cambodia, Laos and Vietnam. These refugees often had much lower rates of educational attainment, little family support and, in some cases trauma from leaving war torn countries, experts said. But Kristof's focus on the "Confucian emphasis on education" is concerning, said Lee. "The underlying tenet is that if groups adopt "the right" cultural values and behaviors, they too can succeed," said Lee. "This argument ignores a host of legal and institutional factors that help some groups get ahead more easily than others," she added. These assumptions often fuel stereotypes of Asian Americans like the "model minority" concept which assumes that "there must be something intrinsic about Chinese culture or Asian culture that are producing these outcomes," said Lee. "They don't understand how status and educational attainment is reproduced from one generation to the next." Asian Americans who don't fit the mold of the "model minority" - high achieving, hard working, good at math and science for example - can face devastating consequences, Lee said. "They feel like ethnic outliers and they feel like failures if they don't live up to the standards," she added.